Health bosses on the Isle of Man have expressed concern at the number of "vulnerable" people who have not received the flu vaccine. Seventeen people in the UK have died from flu-like illnesses so far this winter, 14 of them were infected with the H1N1 swine flu virus. The island's Health Protection Agency (HPA) has urged people in at-risk groups to get immunised. 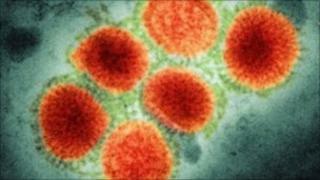 It said the vaccine was effective and offered significant protection. Dr Parameswaran Kishore, Manx director of public health, said: "We do not want to alarm people. "But the fact is that those over six months of age with chronic medical conditions such as heart, lung or kidney disease, pregnant women and people aged 65 and over are at greater risk of complications and would benefit from the protection that the seasonal flu vaccine could offer." Anyone in a high-risk group who has not yet had the vaccine should contact their GP.